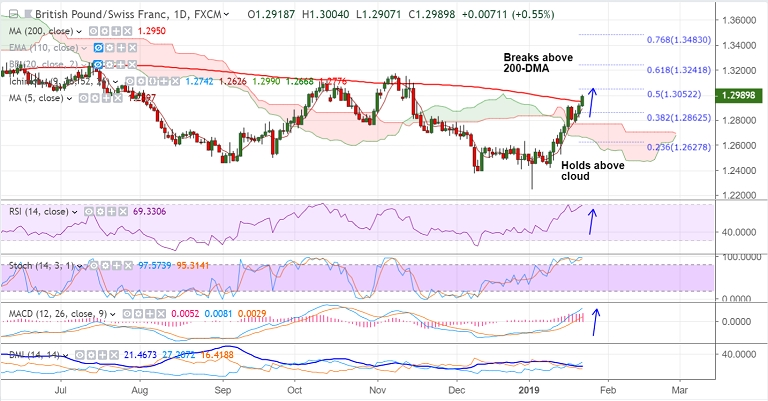 GBP/CHF spikes past 200-DMA to hit 10-week highs at 1.30, bias remains bullish. Technical studies support upside, momentum highly bullish and we see rise in volatility. Price action above daily cloud and we see scope for further gains. Next major bull target above 200-DMA lies at 50% Fib at 1.3052 ahead of 1.3172 (Nov 8 high). Immediate support lies at 200-DMA at 1.2950. Break below 110-EMA will see further weakness.